For the gourmet in all of us. With countless recipe possibilities the Deluxe Sampler will transform your favorite food or beverages into extraordinary secret recipes. 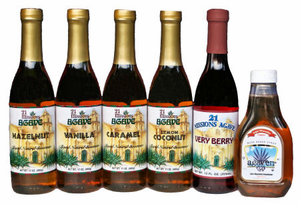 One bottle each of Vanilla, Hazelnut, Caramel, Coconut-lemon, Very Berry and Blue Weber Agave Nectar.